The College of Agriculture and Natural Resources will offer (3 to 4) students the opportunity for a hands-on learning experience working with live Blue Hens from the UD flock while getting paid! 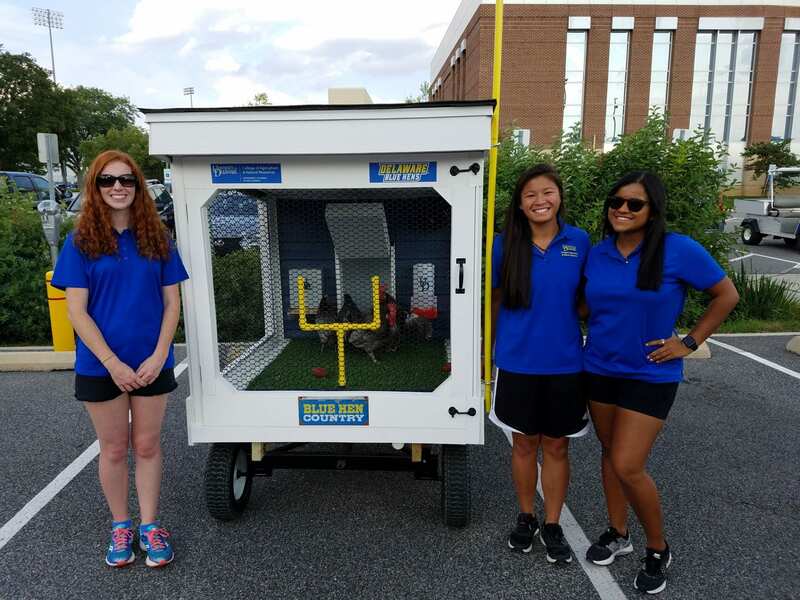 Student interns will gain hands-on care and handling experience with live Blue Hen chickens, display our UD Blue Hens at home football game tailgates, talk to the public about the birds and the importance of the poultry industry in the state of Delaware, and answer any questions. Additionally, interns will display the birds at Ag Day, and at 2 to 4 UD recruiting/alumni events throughout the year. Interns will start by receiving training on the history and husbandry of the birds. Interns will then be responsible for the daily care of the birds for the summer and fall, up until the end of the UD home football season. This includes visiting the birds once per day, 2 to 3 times per week to provide feed, clean waterers, and check the temperatures and the overall well-being of the birds. Each visit should take 20 to 30 minutes; students will be paid a minimum of an hour for each visit. Start date is beginning of June 2019 to allow the birds and interns to become familiar with one another. Interns will be trained on how to use the trailer and golf cart and/or four-wheeler to pull the display trailer to the six UD home football games in the Fan Zone in front of the stadium. Interns should be prepared to spend 1 to 2 hours per week during the summer learning about the care, management and history of the birds, while working with the birds to learn how to handle them and acclimate them to the environment for their fall appearances. Students must commit to working a minimum of 3.5 to 4 hours at each of the UD home games. Interested students should e-mail Prof. Alphin at ralphin@udel.edu or call (302) 831-0825. This entry was posted in Jobs and Internships and tagged animal science, Blue Hens, Poultry by katiej. Bookmark the permalink.